Stay 1,000 feet (3 football fields) away from colonies where seabirds rest and nest. If you see birds acting nervous (e.g. head bobbing, fluttering or flying away) you are too close — move away. Visit https://www.wildlife.ca.gov/Conservation/Marine/MPAs/Network to find out about marine protected areas and Special Closures. Seabirds spend most of their lives at sea but they must come ashore to rest, nest and raise young—often in great colonies. 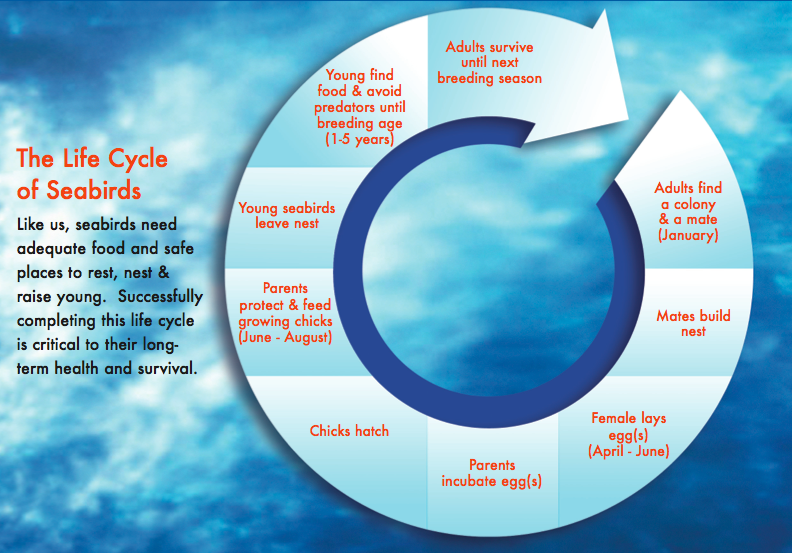 Successfully completing this life cycle is critical to their long- term health and survival. Although seabirds are highly sensitive to human disturbance during their nesting season, between January and September, it is important to keep our distance year-round. Human disturbance causes a change in an animal’s normal behavior. In marine environments, such disturbances are typically caused by close approaches from the water, air or land.